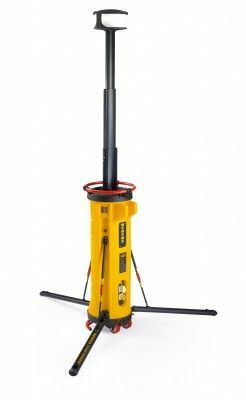 Defender Luminator portable metal halide lighting tower. Made with a super bright 1kW metal halide lamp, the Luminator delivers 100,000 lumens of bright white light in a 360° floodlit effect. Made with a tough roto-moulded body and fully retractable electronic light head for easy transportation and storage. Lamp height extends up to 4 metres. Lockable Support Legs. Adjustable Lamp Height.